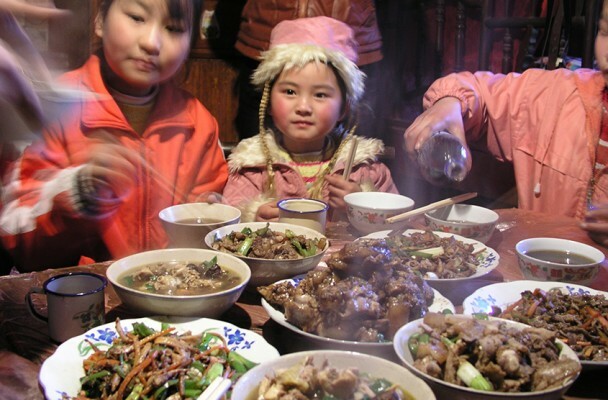 With all good wishes for the Year of the Horse, here’s a picture of New Year’s Day feasting in rural Hunan, 2004. A table of plenty, all cooked either on an old-fashioned wood-fired stove, or in a blackened cooking pot hanging over the open fire on the kitchen floor. We were sitting around that table in an old mud-brick cottage in a beautiful valley. Happy memories. 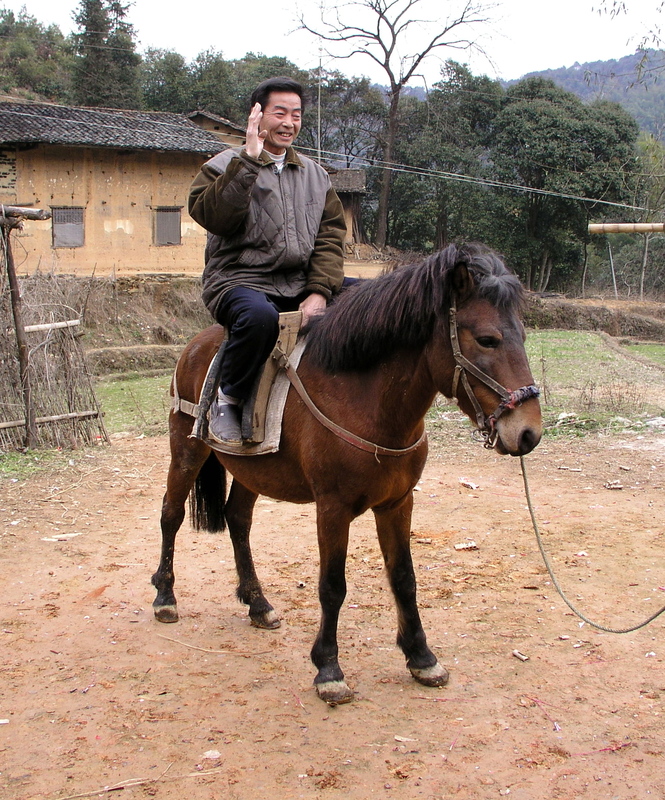 And here’s another pic of my lovely friend Fan Qun’s father on a horse, for the Year of the Horse. 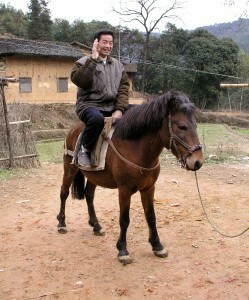 Have any of you blog visitors been cooking anything special for the Chinese New Year? I usually cook chap chye (zá cài; 杂菜) on New Year’s Day. I base it roughly on this method http://www.thelittleteochew.com/2009/05/vegetarian-chap-chye.html, but add some fuzhu and other goodies too. I just fixed Hong Shao Rou from Every Grain of Rice, Firecracker Chicken from your recipe posted recently, and my own version of jiaozi from friends from Tianjin. 4 families gathered with us in Kansas, US. 3 Chinese college students were with us, too. Fun and delicious…bao-ing jiaozi in the Midwest. Shuizhuyu, steamed egg, pai huanggua, guotie, nongcun rou, ganbian sijidou, mapo doufu, potato starch noodles with pickles and pork mince. Yum! Got the neighbours over for Hot Pot! They loved it! I have been so inspired over the last 6 mo cooking from EGOR, thank you. Somehow your recipes just hit home with me and are now part of our regular food routine. Since the new year an obsession with asian dumplings has been time consuming but so delicious. I don’t eat meat but substitute other things in your recipes and they are still very delicious. One change to your ma po tofu is that I fry the tofu cubes crispy for the recipe – not traditional but we love it. Thanks again.